Dog Story Reader Favorites. Share Your Dog Stories Today! Got a dog story to tell, tell it here! Okay dog lovers, and not just Jack Russell fans but any breed of dog lover, this is the page where you can let the world read your own dog story. It has to be original, your own work and not submitted to any other sites on the web. No immoral content, we protect kids here. Submission is easy, and after approval of your story, will be featured here, where I hope there will be many stories for my readers to enjoy as time goes on. This is a new addition at Pics & Tics and so while I wait for other stories to come in, I'm going first. But come on guys, now it's your turn, okay? Okay! Submit your dog story here. I wanted to write a story that is a tribute to George, the brave little Jack Russell in New Zealand that lost his life saving five children from the attack of two vicious pit bulls. We who have known and raised Jack Russells are not surprised by this story, but are completely overwhelmed with love and admiration for this unparalleled breed of dog. 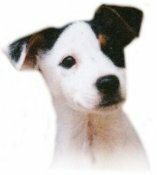 I created this website because of my love for the Jack Russell Terrier. And throughout these pages you'll find I refer to this unique little dog over and over again as the "Napoleon of dogs". And while it has been a bit of tongue-in-cheek as this reference has been mentioned, it does describe the true character of the dog... and for a little Jack in New Zealand who stood against two pit bulls three times his own size to defend the lives of five children, and who, as a sad result, lost his own life to save theirs, this term becomes a great badge of honor. Most everyone has heard the story of George by now. In my research to write this dog story, I wanted to know more than just the report, I wanted to know more about George's life. And when I couldn't find out more than what you yourselves have read already, I began to notice certain points within the basic report that can tell us more about George's personality and what he must have been like. Firstly, that he was following and playing with the children as they were walking. I know by my own Annie how much Jack Russells adore children. When I have Annie on a leash in the park and a child appears at any distance, she cries and pulls to get to the child, as if a god has descended from heaven that she must run to worship and adore and serve. Just to be in the presence of children is my Jack Russell's one purpose in life it seems. Surely this was George's purpose as well. It just breaks my heart to think of how perfectly happy he was in the midst of these children and then to be suddenly called upon to defend at insurmountable odds. And yet without another thought, and without question, jumping to the call of duty to save his objects of worship from any harm. What a precious soul was this little Jack. Secondly, the fact that he was nine years old. This is another point I have discussed before. 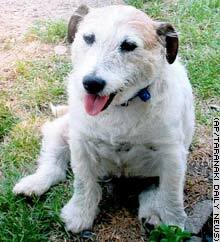 It's very hard to tell how old a Jack Russell is because of their extreme vitality. They just seem to maintain a youthfulness as no other creature I know. My Jimbo was nine years old when he was killed by a larger dog. And it was the Napoleon complex that killed him as well. I saw him many times go up against huge dogs with absolutely no fear whatsoever. And he would become as vicious himself as the meanest pit bull. It was amazing to watch a dog of such small size have such strong impact on big dogs, which most times would run away with tails between their legs never to return again...at least all except for once... when my sweet Jimbo did not prevail. Such also must have been the case of the noble George. Without a thought of any other course, this majestic little general, at nine years old, tears into these monsters with every fiber of his ancestry to defeat the unlawful invaders. If only we could have known more about him...if only he could have survived...if only. But this kind of nobility and heroism always survives in the minds of those of us who love and know the grand character of the Jack Russell Terrier...the Napoleon of dogs. Because of old age, we had just lost two more of the many animals that we had saved from abusive situations. I was not in the mood to take on any more animals, mainly because of the high veterinary costs that we had incurred throughout the years. A process we began almost ten years ago; one that that has caused us many hardships. Read more here. One day my dad was out riding his bike in our neighborhood. When he was on his way back home he began to hear this little clip-clip-clip-clip noise behind him. So he turned around and there he saw a little out of breath puppy following close behind. 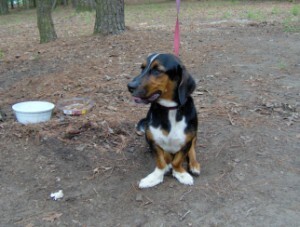 To read the rest of this very sweet dog story click here. My Jack Russel Terrier is the cutest thing. His name is Gator, My parents decided to name him. Well one day i was sitting at home and i look down and there he is just laying their silently his head tilted up right in the little plastic cup. i almost croaked with laughter, gator had fallen asleep with his head in a plastic container! Well I had taken a few pictures and let him sleep although my grandmother just couldn't believe it she was astonished she loves the little dog and so do he is the best dog ever !!! Our Jack Russel is a female by the name of Kleintjie. We did not go out to look for a dog, we were on holiday at Franskraal in the Western Cape when my 7 year old daughter saw the mother dog and the pups at the house next to the one we were staying in. The woman informed us that we were welcome to take one if we wanted. Let me tell you, I am the first to take a dog as I love dogs. But it was not me that made that decision on that day, it was my spouse and 7 year old daughter that told me we have another addition to our home. Kleintjie is a white and brown Jack Russel, so human like it's unbelievable. When she gets bored or just wants to play, she has a habit of throwing things for herself and fetching it. Her front paws are like little hands as she uses them to hold things and is very animated when she jumps up on the side of my leg by lifting her paws like hands. I normally walk out to say by to my mom and Kleintjie would go with and as soon as I lift my hand to wave buy so does she. She is a remarkable little girl. Okay guys, now it's your turn. Send me your own dog story to grace these pages. If you've been wanting to write about George, this is the place to do it. I doubt we'll grow tired of hearing any tributes to this little hero any time soon, if ever. But any dog story, whether it be of heroism or simply funny, please send it to me.